Pilates Machine – The Reformer will change your body! Pilates Machine - The Reformer! There is not just one Pilates Machine, but probably the most popular and highly used piece of Pilates equipment is the “Reformer” as Joseph Pilates called it. He developed a whole repetoire of exercises on this piece of equipment to work towards a more pain-free and balanced body. The Pilates Reformer benefits does just what it says; it Reforms your body! The concept behind the reformer developed by Joseph Pilates is used to rehabilitate injuries, as well as realign our bodies to its natural and proper form. He wanted us all to experience a pain-free and balanced body. The look of the Reformer has changed over the years from its original form of using a bed and springs. It now looks sleeker and works more efficiently. The footwork exercise on the reformer as shown below not only helps to strengthen the feet, but also helps to recalibrate the length tension imbalances in the legs and all the way up to the pelvis and back. Check out some of my Pilates Reformer workout videos here. The history of Pilates exercise equipment is very similar to today’s Reformer. Joseph utilized the springs off of beds while he rehabilitated wounded soldiers in an internment camp during WWI. He was so successful with his Pilates machine in rehabilitating soldiers that the German’s wanted to hire him to do this work permanently with the injured. He instead emigrated to the United States and utilized his expertise in rehabilitating dancers in New York City. The Pilates Machine; the Reformer of today has a sliding carriage and uses spring tension that you can load or unload to modify or vary your exercises. The exercise to the right is the reformer version of the mermaid to stretch the muscles along the side of the spine while strengthening the shoulder girdle on the pushing arm. The machine also has hand and foot straps to perform upper and lower body stretches and strength work. The Pilates Reformer exercises helps to improve your core strength and, in turn your posture. While stabilizing your core on this machine, you can then begin to strengthen your arms and legs with exercises that are joint friendly and very effective at isolating and using the muscles the way they were intended. Leave this Pilates machine and find out more pieces of Pilates equipment and how to use them here. 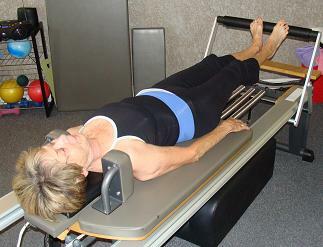 These exercises can be done lying on the Refomer, or from a sitting position on the reformer as shown here. Placing the straps in your hands and sitting tall with a stable core you can do the exercises by pushing or pulling on the straps facing forward or backward. The different positions work to strengthen your back, shoulders, and arms with a stable scapula. Every workout and piece of Pilates exercise equipment is different and is always challenging you to concentrate and focus inward on what muscles are working and how you are feeling. The difference, then, between the Reformer workout and more traditional types of exercise is that you are stretching and strengthening all your muscles at the same time. You are controlling the movements with your mind, always conscious of what your body is feeling. The instructor is always coaching you to “sit taller” or “drop your shoulders”, always looking for better posture and form. I find my workouts on the Reformer to be much more efficient and energizing than any type of exercise I have done before. 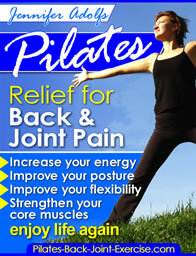 As a fitness professional I have tried everything and that’s why I am writing about and promoting Pilates. I have more happy and satisfied customers than any other form of exercise I have ever taught or promoted in the past.